The International Rescue Committee says more than 60 people have died in recent weeks after making their way out of the last area controlled by the Islamic State group in eastern Syria. Spokesman Paul Donohoe says exhaustion and malnutrition are the principle causes of the deaths. He said Monday that at least 62 people died, two thirds of them children under the age of one. He says they either died along the way or soon after arriving at the camp. Kurdish-led forces continue to fight IS militants clinging to a tiny stretch of land. Syrian opposition activists and paramedics say two bomb blasts have struck the northwestern city of Idlib, killing at least 10 people. The Britain-based Syrian Observatory for Human Rights says the blasts in the Qusour neighborhood during rush hour Monday killed 13 people and wounded 25. The Edlib Media Center, an activist collective, said the bombings killed 10 and wounded dozens. The first blast occurred in the early afternoon and another followed seconds later. The opposition's Syrian Civil Defense, a group of volunteer first responders, said one of its members was wounded. The city of Idlib is controlled by al-Qaida-linked Hayat Tahrir al-Sham, which has wide influence in northern Syria. The city has been hit with bombings in recent months that killed or wounded scores of people. Syrian opposition activists and paramedics say two bomb blasts in the northwestern city of Idlib have inflicted casualties. The Britain-based Syrian Observatory for Human Rights said the blasts in the Qusour neighborhood during rush hour wounded about 30 people. It said there were unconfirmed reports of deaths. The Local Coordination Committees and the Syrian Civil Defense, a group of first responders, also reported casualties. The bombs went off in the same area, just seconds apart. The Observatory and the Syrian Civil Defense earlier reported government shelling of rebel-held towns south of Idlib, saying several people were wounded. 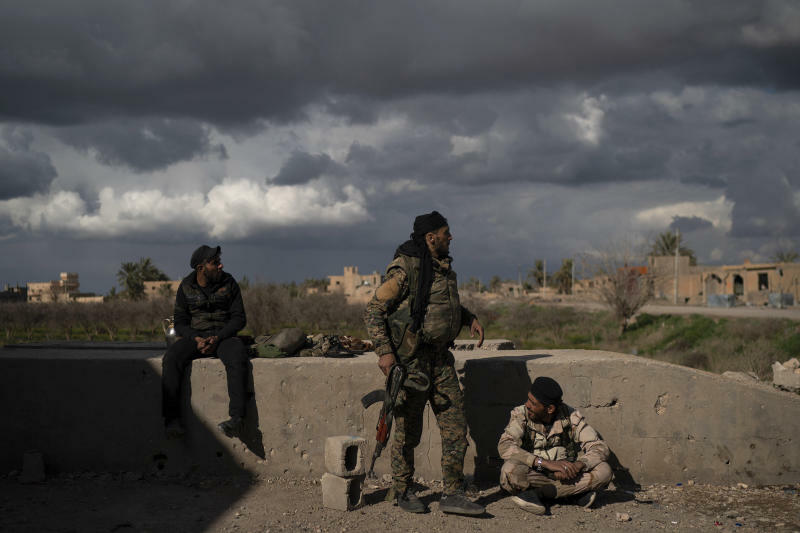 More than 300 Islamic State militants who are holed up in a tiny area in eastern Syria are refusing to surrender to U.S.-backed Syrian forces and are trying to negotiate an exit. A person familiar with the negotiations says the militants are asking for a corridor to the rebel-held northwestern province of Idlib. He spoke on condition of anonymity because he was not authorized to speak about the talks, which he described as taking place indirectly. The Britain-based Syrian Observatory for Human Rights, an activist group that monitors the civil war in Syria, says another request by the Islamic State group to be evacuated to neighboring Iraq was also rejected. The militants are making their last stand in eastern Syria, hiding among hundreds of civilians.